Facebook-owned WhatsApp messenger has been undergoing huge changes lately. After a crucial 2016 business year for Blackberry and Nokia smartphone giants, WhatsApp support will reportedly end for BlackBerry, Nokia platforms, as well as some iPhone and Windows phone models by the end of December, this 2016. At this point, brands like BlackBerry and Nokia has been in a tricky position financially so in an attempt to win back some customers, the companies moving from their branded OS to Google’s Android platform. However, this has led some companies, like WhatsApp and Facebook to presume that their OS might be dead now, which is causing support to be discontinued by the end of this year. WhatsApp announced earlier this year that it would be ditching its BlackBerry app by the end of 2016 and Facebook also has confirmed that it would be discontinuing support for the BB API as well. 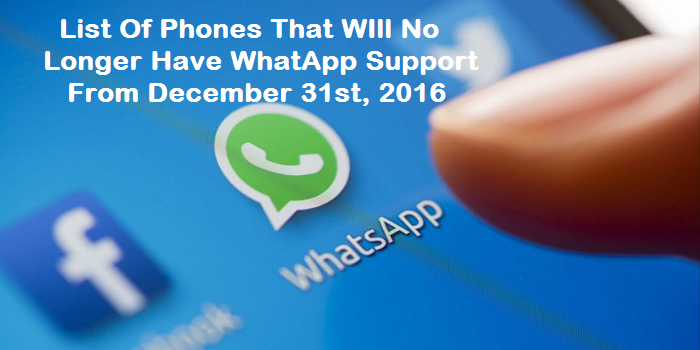 Now, we are bringing you a list of phones that will no longer feature WhatsApp support by the end of 2016. All Blackberry phones including blackberry10 devices will no longer have WhatsApp support. WhatsApp support will end for all Symbian phones which includes; Nokia 500, Nokia E6, Nokia 5228, Nokia 5230, Nokia E63, Nokia 5233, Nokia E66, Nokia 5235, Nokia 5250, Nokia E7, Nokia 5320, Nokia E71, Nokia 5530, Nokia E72, Nokia 5630, Nokia E73, Nokia 5700, Nokia E75, Nokia 5730, Nokia E90 Communicator, Nokia 5800, Nokia N76, Nokia 600, Nokia N78, Nokia 603, Nokia N79, Nokia 6110, Nokia N8, Nokia 6120, Nokia N81, Nokia 6121, Nokia N81 8 GB, Nokia 6124,Nokia N82,Nokia 6210,Nokia N85, Nokia 6220, Nokia N86 8 MP, Nokia 6290, Nokia N95, Nokia 6650 Fold, Nokia N95 8 GB, Nokia 6700, Nokia 6710 Navigator, Nokia N96, Nokia 6720, Nokia N97, Nokia 6730, Nokia N97 mini, Nokia 6760 Slide, Nokia X5-01, Nokia 6790 Surge, Nokia X6, Nokia 700, Nokia X7, Nokia 701 and Nokia E55. All Nokia S40 Phones Includes; Nokia Asha 201, Nokia Asha 300, Nokia Asha 302, okia Asha 303, Nokia Asha 306, Nokia Asha 311,Nokia C3-00, Nokia C3-01, Nokia X2-00, Nokia X2-01 and Nokia X3-02. Therefore if your phone falls within the stated range, you are advised to either upgrade to the newer version of Andriod, iPhone, Window or get newer ones before the due date.